The Imperial Porcelain Factory in St Petersburg, Russia created some amazing work during the Revolution. From around 1905 to 1930, a group of artists produced images and narratives that led the way in three dimensional design at the same time as promoting the Communist Party. Plates that were left in the factory, that was primarily used for the production of porcelain for the Imperial courts of Russia, were used as paper is used for posters. 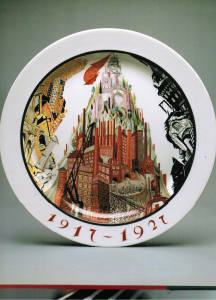 Essentially these sets and plates that were waiting for decoration, were an advantage to the Communist Party and to their propoganda campaign as well as to the artists that were commissioned to work in the factory. The group of artists that were ’employed’ on site where painters, sculptors and graphic designers. This is why the work they produced was so exciting and new. These artists were not used to working on the three dimensional form, however, they created work that is inspiring. This is the area that I am studying in my Ph D. Well, it is my starting point really. The question I am posing is..what is political ceramics and where is it in the 21st century? that’s a rough version of one of the questions i am going to answer.